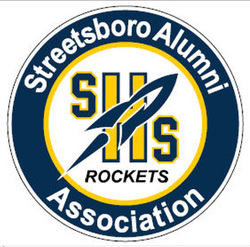 Show your Rocket Pride and become a member of the Streetsboro Alumni Association. All new lifetime members will receive a free window decal and a laminated membership card which allows admittance to home sporting events at a reduced price, and a quarterly newsletter. Click on the Lifetime Membership List link below to see if you are a member of the Streetsboro Alumni Association. If your name is not listed on those pages, HOVER your cursor over the JOIN NOW ONLINE tab and click on Join Online Now, and complete the information or you can click on the Membership Application Form, print the form, complete and mail it to the address on the membership application form. See next paragraph for who may join. Membership is open to of any attendees/graduates of Streetsboro High School and Streetsboro students graduating from other high schools when there was no high school in Streetsboro. Streetsboro High School students may become associate members of the Association upon the payment of dues or commitment to service upon one or more standing committees of the Association. Teachers and administrators of Streetsboro Schools may become associate members of the Association upon the payment of dues. Citizens of Streetsboro may become associate members of the Association upon the payment of dues. Associate members may attend open meetings and take part in discussion but shall not vote, make motions or hold office. Annual dues for Streetsboro High School Graduates will be $5.00, and a Lifetime Membership is $25.00. Annual dues for Streetsboro High School Students (associate membership) will be $1.00. Annual associate dues for teachers and administrators of Streetsboro City Schools, or citizens of Streetsboro will be $5.00, and a Lifetime Associate Membership is $25.00. Current members may also request a decal if they didn't receive one when they became a member. If you would like to purchase an additional decal, the cost is $2. Decals will also be available at the annual alumni dinner. To request a decal, email: streetsboroalumniassociation@gmail.com or use the CONTACT page here on the website. Include your address. For questions on membership, contact Ed Szumski at ProfessorEd68@gmail.com.